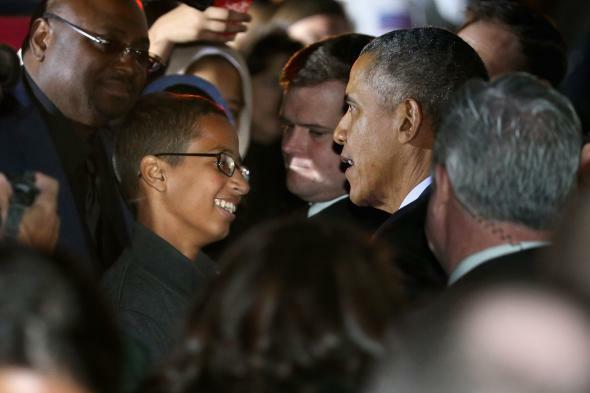 Ahmed Mohamed demands $15 million for Texas school “hoax bomb” clock arrest. President Barack Obama (2nd R) talks with 14-year-old Ahmed Mohamed during Astronomy Night at the White House on Oct. 19, 2015. Lawyers for the family of Texas teenager Ahmed Mohamed—better known as the “clock kid”—demanded $15 million from the city of Irving and its school district for the reaction to the homemade clock Mohamed brought to school in September. The story made global headlines as the 14-year-old Muslim high school student, an aspiring engineer, was arrested and suspended from school after a teacher mistook his clock for a bomb. - It says that during the questioning, Ahmed’s principal threatened to expel him if he didn’t admit that his clock was a hoax bomb—though he had never claimed it was anything but a clock. - After police dropped the charges and news of the arrest went viral, city and school officials devised a plan to “trash Ahmed” to the media, according to the letter. - School officials insinuated that Ahmed wasn’t telling reporters the truth about his arrest, and publicly pressured his parents to let them release his private student records. - Officials falsely claimed that Ahmed violated school policy and “zero tolerance” laws, none of which apply to his homemade clock. “In ways that are virtually impossible to comprehend, this thing turned the Mohamed family’s lives upside down,” the letter to the city reads. “All semblance of what they knew before has vanished.” The letters also single out Mayor Beth Van Duyne and her interview with Glenn Beck in the immediate aftermath where she painted Mohamed—without evidence—as a jihadist who planned to get arrested to further “civilization jihad.” Mohamed’s family is seeking $10 million from the city of Irving and $5 million from the local school district, as well as written apologies from the Irving Mayor Van Duyne and the city police chief. The letters threaten a civil suit if the demands aren’t met. The Mohamed family has since relocated to Doha, Qatar where Ahmed accepted a scholarship to study.